When discussing with amateurs sending QSL cards regularly, one notes that after many years of waiting (over 5 years), between 50 to 75% only of QSLs sent to DX stations come back via bureau. The return rate is only of 25% or lower for domestic contacts. The situation is worse for SWLs with a return rate of QSLs sent to DX stations of only 21% after 4 years of waiting, including some tens of "not in log" ! The concerned amateurs find that this amount is "normal" and that 50% of losses are still an acceptable quantity. Some users even claim that if they sent a QSL to each contact worked (OT often sent their QSL only on request or to confirm a new entity, WPX, band or mode), the return rate would fall down to about 10% only ! But I must disappoint them in saying that nothing justifies such a loss when we know how work QSL bureaus and that QSLing direct more than 99.5% of the QSLs arrive at destination and are successfully exchanged. In fact the 0.5% remaining are QSLs badly addressed or pirates stations. What could explain such low rates of return and such differences of delay between QSLs sent by a licensed amateur and a listener ? The delay does not only depend on the distance : I receive exactly at the same speed (say after 2 years) a QSL confirming a QSO with a station located 100 km away and a remote station located 10,000 km away worked at the same period. We cannot say either that the QSL route was in error and corrected by the remote bureau. For SWLs, I don't know if this is casualness but I am almost sure that this delay represents a lack of interest from most licensed amateurs towards the SWL community; they received the QSLs in the same time, there is thus no reason to delay one correspondent and not the other... excepted if somewhere the status of the amateur is taken into account. 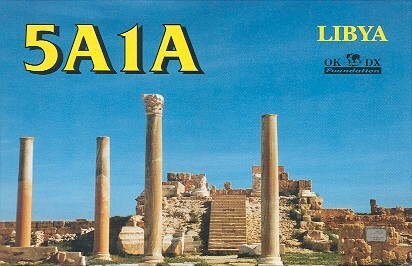 QSL published with the courtesy of ON4LDU, high speed CWer. Usually your first QSLs sent via bureau from near countries should begin to come back 4 months later in average. For the longest trips that can last years. Where did they go, via what route, nobody exactly knows. 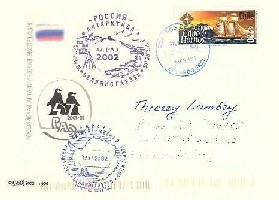 Some amateurs suggest that their recipients sent their QSL cards once a year, that the amateur was abroad for some months or that their country was subject to political conflicts. But as we will see, these events, however, do no explain all cases. When the concerned amateurs thought about all their lost QSLs they quickly seek to understand what happens and wonder if they have well all cards in hand. And it is here that problems arise ! The casual amateur working 100 QSOs a year or the novice SWL is unaware of this problem and often doesn't worry about his (her) QSLs once they are deposited at the club to the attention of the QSL manager or at the post office if he (she) is QSLing direct. In his (her) mind, like in the one of most amateurs, the road is direct to the destination and vice versa. But I have to disappoint you. 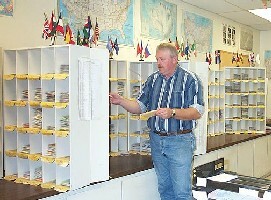 Martin Cook, N1FOC, sorting outgoing QSLs sent via ARRL bureau in various bins, ready to be forwarded. This bureau manages about 2 millions QSLs each year ! Thanks to you for all the work accomplished. Document ARRL. Although the road is perhaps direct by definition, other factors can easily divert it from its objective. Let's take the difficult cases of some distant countries that receive the visit of a boat only once every 3 months (e.g. 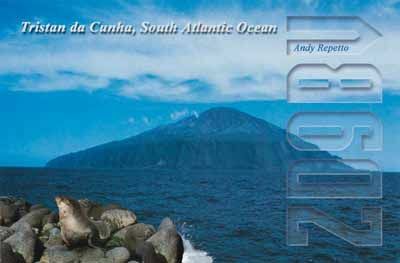 Tristan da Cunha), or which post office is badly organized, the political regime totalitarian or the one of an uninhabited region receiving occasionally some visiting hams. These are indeed mainly QSLs of amateurs working from these countries that will pose you the most problems. But not only those as we are going to see it. If there is no QSL bureau - at least one representing amateur radio association - in the concerned country, a first difficulty occurs. Let's take the example of Libya where there is only one ham, 5A1A, who is unfortunately no more active these last years as he is studying in Europe. We have to count with the rare DX-peditions to confirm that entity. Obviously this "most wanted DX" does not have a QSL bureau. If you are unaware of that check immediately my download page to browse the list of DXCC entities for which there is no QSL bureau (check column "QSL ?"). There are a few tens of them. 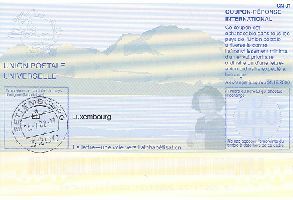 And if you had had the bad luck to deposit your QSL at your club in order they be sent via bureau at destination of this country, be sure that it will never arrive to the destinee and will quickly (6-12 months) come back with the mention "No QSL bureau" ! For the most known of them, usually the QSL manager of your club can still extract them when he will sort them with the other outgoing QSLs, and inform you of the situation. Otherwise your QSL is gone for a two-way very long trip. Let's take another example. At the time of certain DX-peditions working from remote islands, far from any civilization, if you send your QSL directly to that island, the postman can be unaware that there is life on this rock or on this fine sand beach, and your beautiful glossy QSL will remain at the bottom of his bag in the main post office, until he will learn that there were an expedition at this place, but generally your QSL will be simply classified vertically or it will be return to you 2 or 3 years later with the mention "address unknown" or "not a subscriber", "not member" or "unknown" as for him FO0AAA for example is not a person and nothing can tell him the contrary ! These few cases represent already a lot of circumstances that reduce your chances to receive a QSL if you do not pay attention to it. Many SWLs, as they cannot really checked the call signs, are cofronted with such problems. In fact all operators of DX-peditions and even some amateurs explain during their QSOs what to do to get their QSL like for example to "check the QSL info on QRZ.com". Of course if you cannot access to the Internet you have to insist and ask the information to the operator or to a friend connected to the web. The same procedure applies sometimes to special events, portable, mobile and maritime operations. This is for example the case with 4U1ITU. Each operator requests that you send your QSL to his home call (his own call sign, e.g. for 4U/LX4SKY this is LX4SKY). As required, you must thus check the QSL information on QRZ.com as required. But there are several other sources of information than QRZ.com like IK3QAR QSL Manager lookup which is one of the most complete, 425 DX News, NO4J, OPDX, and QSL info databases like Pathfinder, Buckmaster, QSL, and HamGallery to name some others. Of course the other solution is to check on the website provided by the DX-pedition's operator to get the QSL manager's call sign according to the mode and time of the QSO (you maybe worked several times the same station, but as teams change during the DX-pedition, it is sometimes asked to send your QSL to the right operator instead of to a general QSL Manager). This way of working with a QSL manager needs some explanations. Indeed, many amateurs entrust their QSL service to another people (who can be themselves once they are back home or another people) called a "QSL Manager". 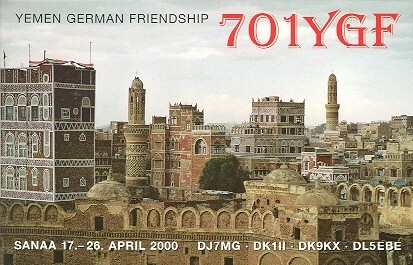 The back side (verso) of my current QSL showing the QSL manager and the way to answer. This volunteer processes all QSLs addressed to one or more call signs as would do the operator. Only difference, if we take my call ON4SKY, instead of sending your QSL to the UBA bureau in Belgium, I ask you during the QSO "to send your QSL to the LX buro, to my manager LX4SKY". 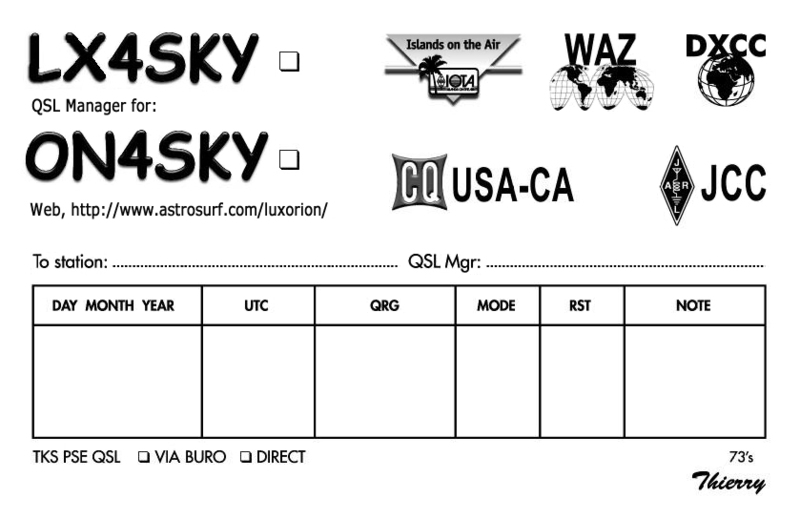 In other words when you will complete your QSL you have to add after my call sign "via LX4SKY" or completing the dedicated field "QSL Mgr: LX4SKY" as shown on the QSL displayed at right. As some amateurs don't check the "QSL info" also called the "QSL route", they are thus confronted with this problem and they imagine probably that the amateur has a fixed address in that institution, on this boat or in that remote country. So they are surprised when they receive their original QSL back a few years later without confirmation and labelled "bad call sign" or "address unknow". So, I suggest you to: check the QSL info of all stations you contacted or listened showing a special or rare call sign, specially during contests, when celebrating a special event and of course the one of DX-peditions and for all pile-ups. Of course, if you have time, confirm the QSL info during the QSO. At last, SWLs are confronted with an additional problem. Sometimes they think to have well understood the call signs of both amateurs in QSO and send their QSL, listing often only one contact. But it happens that they wrote a bad call sign. What a disappointment when their QSL sent to this far DX comes back with the note "Not in Log", "N.I.L. ", ... To avoid such errors, it is thus very important for SWLs to list at least three stations that the amateur worked during that time to have all chances to confirm their listening report and get this so long-awaited QSL. But even so, SWLs will still experiment more than one "Sorry, not in log" as they can never check with certainty the call signs of stations heard. Like all amateurs should do it, I answer to all SWLs, that they list one or several QSOs at the condition that the QSO information is correct. Some amateurs are even kind enough towards listeners to correct the call sign when for example one letter of the suffix is wrong knowing very well that the listener can not check their information on the air, HI ! But I do not encourage OMs to correct SWL reports as usually they have all the time to listen the call signs even if this is a bit harder during pile-ups. Either the recipient provides you his or her address at the time of the QSO or asks you usually to "QSL via QRZ.com". Otherwise, try as we just told one of the other QSL info databases available on the Internet or query ham clusters or reflectors to get his QSL info. 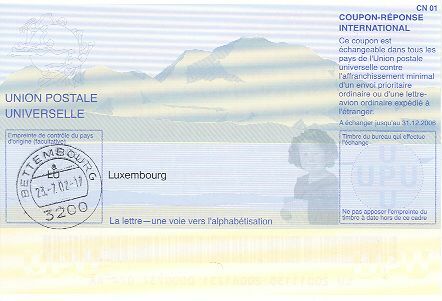 An IRC emitted by the post office of Luxembourg. It give right to its counterpart nearly everywhere. In case of suspicious, join one more IRC. You can also check your electronic log if it includes an updated database of QSL Managers (as do e.g. DX4Win) or query the database of a DX cluster like DX Summit in searching for this call sign. When you get the information follow strictly his or her requirements and do not take the risk to work in another way. We will see in the second part that not all IRC (International Reply Coupon) are equivalent and that some countries, even bordering ones, request more IRC than others. In general to obtain a response, in Europe everyone joins to his mail one IRC, as it can be exchanged for one or more local stamps in most post offices. If your correspondent asks for 2 IRCs and an self-adressed envelope (SAE or SASE) for the answer, send him what he asks : place your QSL in an envelope #10 and join an envelope #9 or #8 inside, folded if necessary, on which you will write or seal your complete address for the return completed with 2 IRC (nowadays the seal of the post office is optional as listed on new IRCs). To prevent to tear the SAE (rarely but than can happen) when the recipient or the postman will open the first enveloppe, insert the second and shorter one upside down in the larger one (or vice versa flip the larger envelope in the smaller). If the amateur requests you "one GS", this is the keyword for the green stamp, the $1 US banknote. The "green stamp" is better appreciated that IRC in most countries. If an amateur asks you more than 2 GS, consider the deal as suspect and try to convince him to only accept your 2 GS, explaining him that this price should only cover the stamp price to return the QSL by air mail rather than his life-style. We will come back of postage rates on the next page. If the recipient requires the QSL by registered mail (about 3 € instead of less than 1 € for an ordinary mail sent worldwide), with 1 GS and 1 SAE, in spite of his petrodollars, if you really want his QSL you should accept the deal. But personally I suggest you to negociate and to bypass the registration which is useless. On the long run this manner of working will cost you much money, and for one of us more than 1000 € the first years, but it is often the only way to get the first QSL of an new rare entity you just worked. Like me, this friend uses to work this way and appreciates this method which is very fast (1-2 months to get the QSL) and up to now 100% sure. 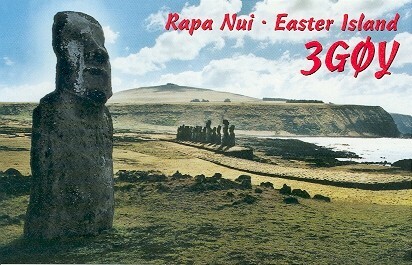 No one QSL is missing even the ones celebrating special events. Personally in the past I sent about three hundred QSLs direct, mainly the ones addressed to the "most wanted DX", to African, Asian, and Pacific stations. Now that most DX entities are confirmed I mainly use the bureau. But for a while I prefered to devote a budget to QSLs than investing in a better antenna or a linear amplifier. Now that I have most of my entities confirmed, I see the problem differently, HI ! It is a choice that not everbody shares. However, we all know how exciting could be the fact to receive a very rare QSL some weeks after have worked the remote station, and for which you had to fight on the air sometimes against kW-class amateurs. I continue to work this way with new Antarctic bases and some rare DX stations. 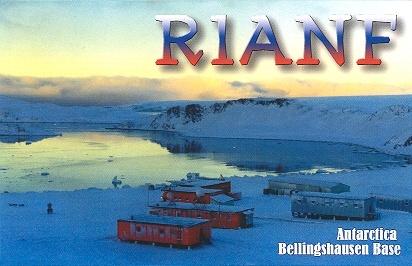 R1ANF's envelope and QSL. Due to their rarity, such sealed envelopes are worth as much as an ordinary QSL due to the number of special postmarks printed on them. Any expedition in Antarctic, including television teams, have their own seal. Don't miss the occasion to work them ! For the Antarctic bases, if there is no pile-up I try to get confirmation of their full address during the QSO and in exchange they send me their beautiful QSL which envelope is always sealed with very attracting logos as the one displayed above. More than one amateurs use this method to get unusual documents that they keep as collector items.